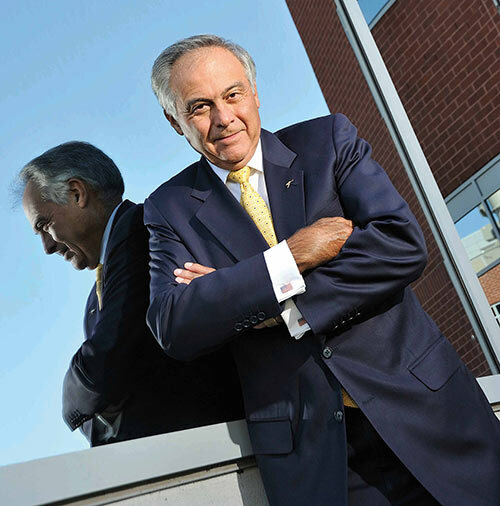 Dr. Luis M. Proenza was president of the The University of Akron from 1999 to 2014. He led its transformation into a powerful engine for regional economic development, a catalyst for collaborative initiatives, and the preeminent public university in Northeast Ohio. Under his leadership, the University completely transformed its campus, adding 21 new facilities, 18 major renovations and additions and 34 acres of new green space, thereby becoming one of the most attractive metropolitan campuses in the nation. Dr. Proenza also led community efforts to create two key enterprises: a University Park Alliance that is revitalizing a 50-block area surrounding its campus, and the $200-million Austen BioInnovation Institute in Akron, a partnership with three area hospitals and a medical school to establish Akron as a center for biomaterials and biomedicine. In his first 12 years as president, UA’s revenue and research portfolio more than doubled, and private donations increased to all-time records. In 2007, Dr. Proenza initiated a $500-million comprehensive campaign that garnered more than $620 million in gifts and pledges by the end of 2009. These and other initiatives have distinguished the University nationally and internationally and have made UA a recognized national model for technology commercialization, economic development, and corporate and community partnerships. Dr. Proenza has been involved in national science and technology policy matters since the 1970s when he was study director of the National Research Council-National Academy of Sciences' Committee on Vision. He also served as the University of Georgia's Liaison for Science and Technology Policy, a member of the National Biotechnology Policy Board, and Advisor for Science and Technology Policy to the Governor of Alaska. In 1992, U.S. President George H. W. Bush appointed Dr. Proenza to the U.S. Arctic Research Commission. In 2001, President George W. Bush named Dr. Proenza to the President's Council of Advisors on Science and Technology, the nation's highest-level policy-advisory group for science and technology. Dr. Proenza co-chaired PCAST's committee on Public-Private Partnerships and worked on panels on U.S. Research and Development Investments, Technology Transfer, Alternative Energy, Energy Efficiency and Advanced Manufacturing, Personalized Medicine, Information Technology, and Nanotechnology. In 2004, the Secretary of Energy appointed him chairman of the Science and Mathematics Education Task Force and, later, to the Secretary of Energy Advisory Board. He served on the executive committee for the Council on Competitiveness and its Manufacturing Competitiveness Steering Committee, and its Regional Leadership Institute Steering Committee, which he chairs. Recently, Dr. Proenza was appointed to the Council of the Government-University-Industry Research Roundtable of the National Academies and to the Technology Innovation Program Advisory Board for the National Institute of Standards and Technology. He also is a member of the Council on Foreign Relations and a board member of the States Science and Technology Institute. Dr. Proenza is a member of many other professional, scholarly and honorary organizations; is the recipient of several awards and honors; has written numerous publications in nationally and internationally recognized journals; and edited and co-edited two books. He frequently is invited to speak worldwide, with presentations appearing in Vital Speeches of the Day and The Executive Speaker. He often is quoted on issues in education, research, economic development, and science and technology policy. the 2001 Executive of the Year Award from the Society of Marketing Executives. After earning a B.A. from Emory University (1965), M.A. from The Ohio State University (1966) and Ph.D. from the University of Minnesota (1971), Dr. Proenza joined the faculty of the University of Georgia in 1971. There, his research in retinal neurophysiology was supported continuously by grants from the National Eye Institute, including a Research Career Development Award. Prior to his appointment at Akron, Dr. Proenza was Vice President for Research and Dean of the Graduate School at Purdue University. He also served the University of Alaska first as Vice Chancellor for Research and Dean of the Graduate School, then as Vice President for Academic Affairs and Research. Dr. Proenza and his wife, Theresa Butler Proenza, enjoy their careers, friends and numerous community activities. Together, they built the 44-foot sailing vessel, Apogee, which they sail on Lake Erie.